Well this countdown malarkey is going fast…since I’ve been paying attention to it anyway! 95 days!! Argh!! In Peru a lot of the buildings are only one storey high, so for security Peruvians put a dog on the roof and LEAVE IT THERE 24/7! The roof dog is their security guard. I don’t know why they can’t use barbed wire, broken glass…..you know the usually building security measures. Obviously the roof dog is a very angry dog because it’s left on a roof 24/7. I don’t know if they train it to bark at anything approaching the building or not but they do bark ALL THE TIME. At the hostel I’m staying at there is a dog on the roof behind and literally when anything passes the building it goes mental. GRRRRR so irritating! This morning it woke me up at 7am barking at a passing pedestrian. In Cusco there was actually a dog on a building higher than one storey, maybe three storeys high. It just stayed there all day and all night in the freezing cold, I felt really sorry for it. Imagine in England if everyone just had a dog on their roof to scare away burglars……crazy! Today I’ve been mostly trying to edit this website. I’ve been working on updating the “My Travels” section. Wow it’s taking a while but I’m totally addicted. ALTHOUGH computers can be SO frustrating…..I move my picture one way…..the computer moves it another….It normally results in me shouting at the screen. Hopefully by the end of today I will have finished half of the “My Travels… Asia” section….maybe, just maybe! (This will cover Thailand, Vietnam, Cambodia so far…). I have to get a move on with it because at the weekend I’m probably going to go to Bolivia where the WIFI opportunities are supposed to be terrible. Food, FOOD, FOOOOOOOD 🙂 No saltenas & papa rellenas today! 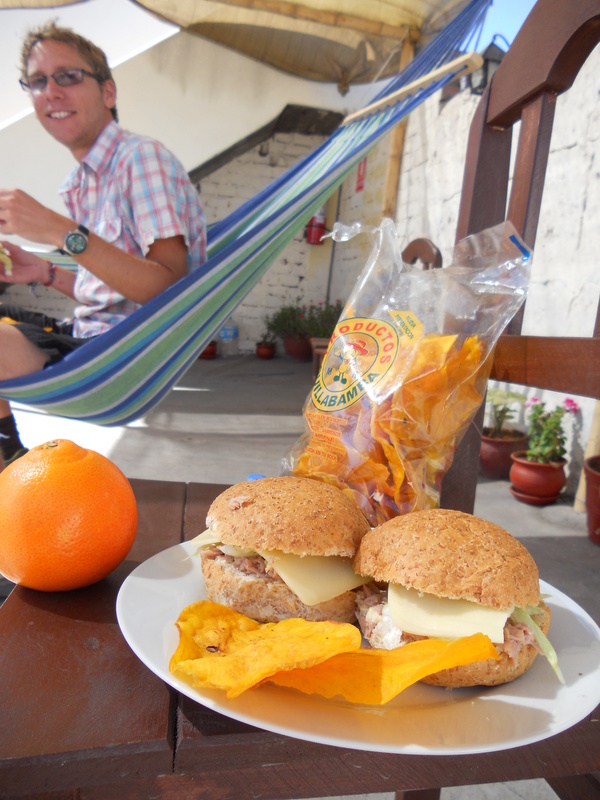 It was time to make my own lunch and eat it on the hammock on the roof, woo! So, that consisted of tuna sandwiches (a travelling classic as tuna is the only safe sandwich filler in the South American supermarkets). Also sweet potato crisps and an orange. WOW how exciting?! I’m really making the most of my last few days in Arequipa. I’m doubling up to two showers per day (just don’t tell anybody). This is because every traveller I meet who has come from Bolivia KEEPS telling me there is rarely hot water in any of the hostels!!! 😦 This sounds absolutely dire 😦 especially as the majority of Bolivia’s tourist sights are in the freezing cold mountains. Boohoo. So, I’m increasing my hot water usage, lapping up the warm weather and making the most of wearing flipflops! P.S….. It’ Peru’s Independence Day tomorrow….looking forward to some parades and celebrations. The city looks incredible, pretty much every building has a Peruvian flag waving from the top of it, stunning. 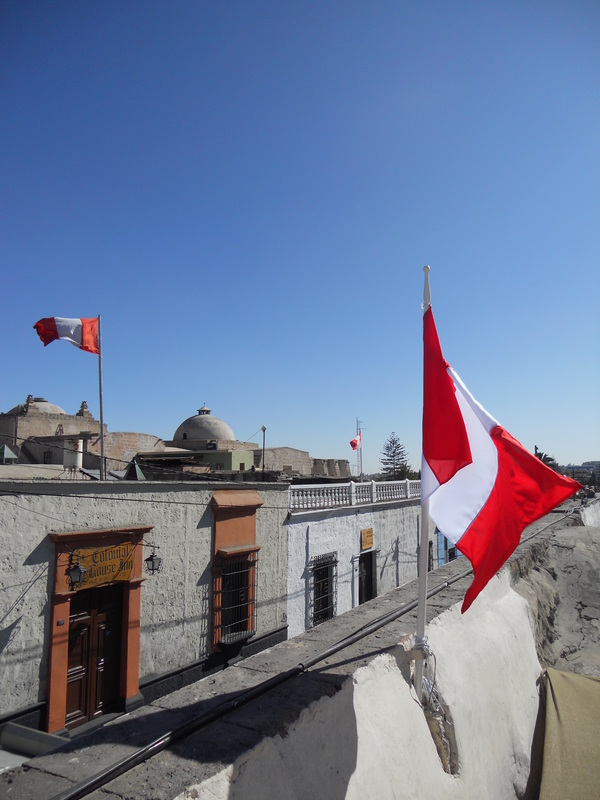 Peru – Arequipa – Lots of Peruvian flags on the rooftops in preparations for Independence Day. 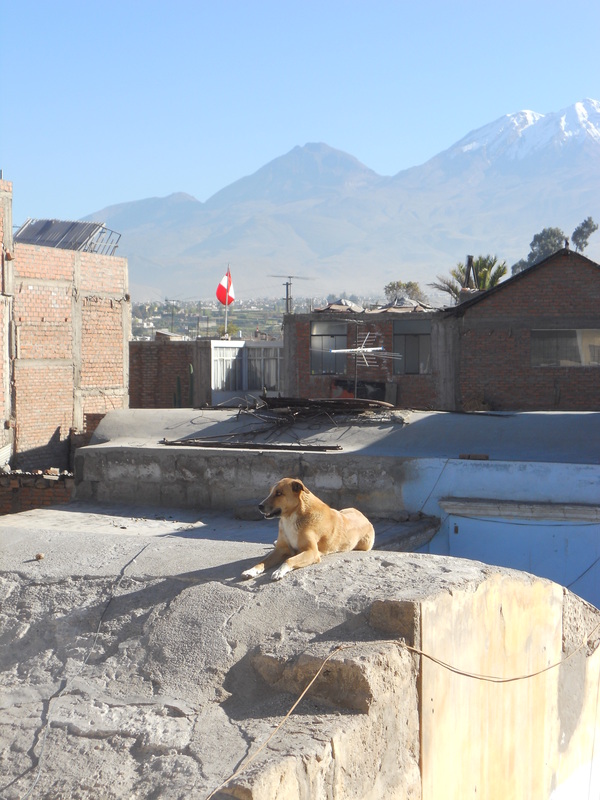 Peruvian roof dog gets you up at 7am is that not the time you normally get up?????? Love the blog web site is there a slice of cheese on your tuna sandwich? Nope I definitely don’t get up that time when I have a comfy bed and pillow!! Yep cheese on the sandwich, found some Edam yesterday that’s ok!